Buick has a plan to win you back. It starts with a 310-horsepower, AWD luxury liftback. You might call it a heroic task, an essential duty handed down from generation to generation. Or, if you're being uncharitable, it's more like a mission impossible for these changing times. Either way, it's hard to deny that the folks at Buick have been given something of a monumental challenge in reinvigorating the once-staid brand and getting people excited about a sedan as buyers continue to reject the form out of hand. You'd need a highly specialized tool to walk that razor-thin line—enter the 2018 Buick Regal GS, a 310-horsepower, naturally-aspirated liftback with a lot to prove. For many, the Regal nameplate conjures up images of rounded, front-wheel-drive boats with a bench seat up front and ashtrays in the back. That was especially true in the early aughts, when the Buick Park Avenue, LeSabre, Century, and Regal were all shades of the same color. After Buick's popularity in China spared it from the executioner's sword during the recession, the bosses at GM raided their Opel division across the Atlantic to bring a little European style to the brand back home, resulting in four co-developed products: the Buick Verano (Opel Astra), Buick Encore (Opel Mokka), Buick Cascada (Opel, uh, Cascada), and of course, the re-launched Buick Regal (Opel Insignia). It's easy to scoff at the "better living through corporate synergy" ethos on display here, especially since badge engineering is partly what sunk the old GM in the first place, but there's no question the Opel-Buick partnership has drastically improved their lineup. The Buick Regal is no exception, as the car's refreshed styling at the start of the decade helped draw the praise of critics and propel it to over 40,000 sales in 2011. In an effort to highlight the brand's performance heritage, the Gran Sport (GS) trim was added, offering a more powerful four-cylinder engine, a sportier suspension, and a six-speed manual transmission. Fast forward six years, and my, how times have changed. Buick sold just under 20,000 Regals last year, all while their total sales have steadily increased on the strength of its crossovers. We all know why that is; what's less obvious is what to do about it for the next generation. And I have to admit, a 310-horsepower, all-wheel-drive luxury liftback with sporting pretensions is an intriguing answer. 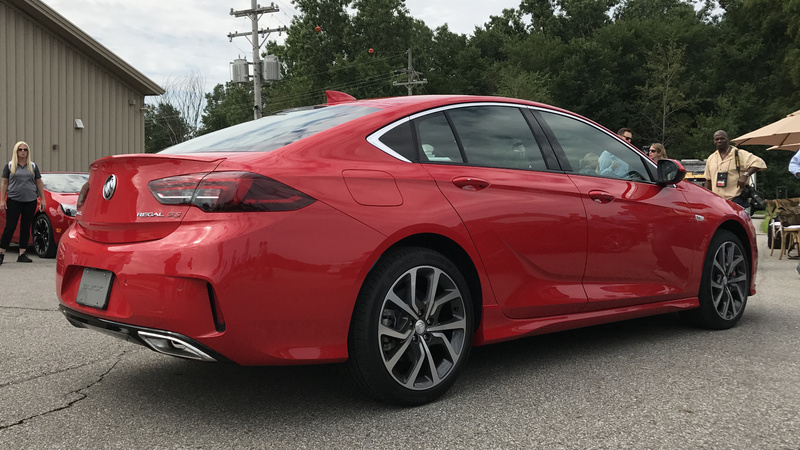 I spent the better part of a scorching July morning at General Motors' proving grounds in Milford, Michigan flinging a pre-production 2018 Buick Regal GS around their "Ride and Handling" road course to see if they're right. Visually, they're off to a very promising start. 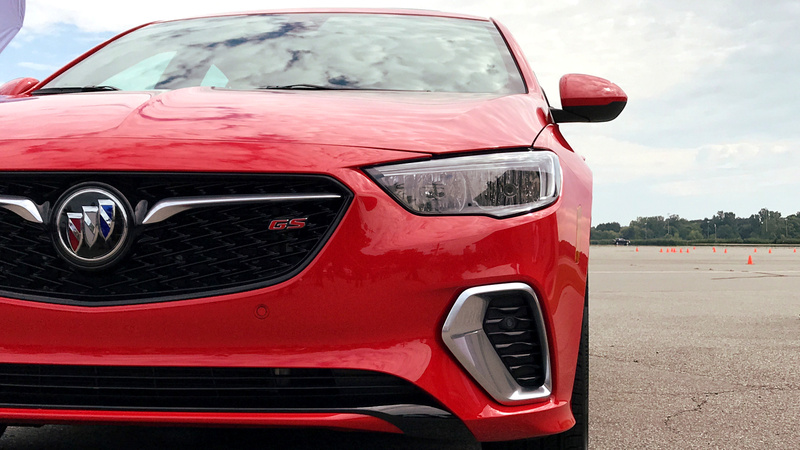 The Buick Regal GS is undeniably a good-looking car, with a redesigned front end that manages to be both sleeker and more angular than the outgoing model. The low hood keeps the car from looking too tall, while the sloping roofline and almost imperceptible notch of a traditional trunk lid recall the Audi A5 Sportback and BMW 3 Series GT. Yet the liftback integration looks a bit more cohesive here compared to ze Germans, helped in part by the raked rear bumper. I wouldn't call it stunning, but I wouldn't kick it out of my garage either, which is generally the sweet spot for mass market appeal. On the inside, we've come a long way from the days of blue velour benches. 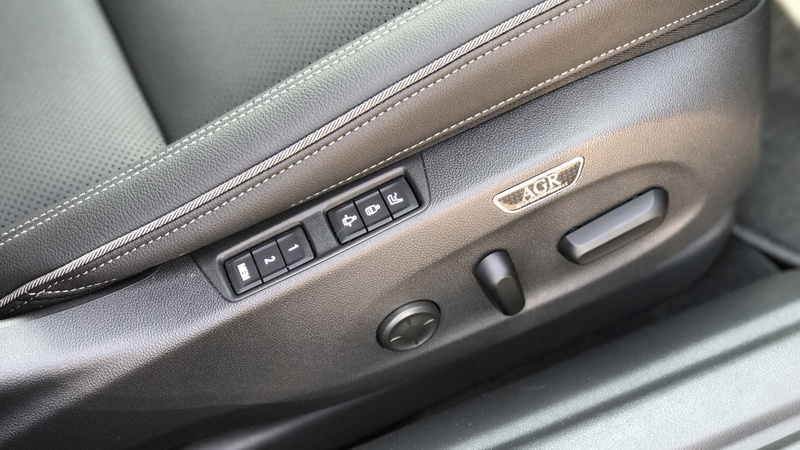 Up front, the heated, ventilated, and bolstered sport seats have about a zillion power adjustments and are certified by AGR, an independent ergonomics group. 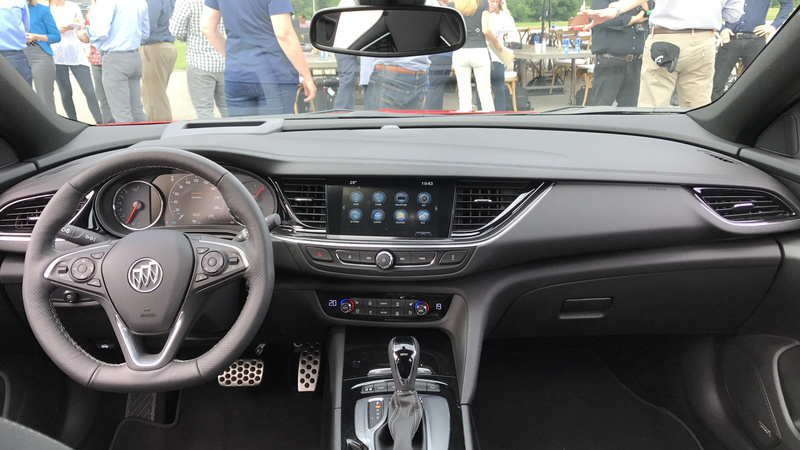 Overall I'm a fan of the dashboard and center console design, which features a real tactile shifter and a flat, horizontal motif that reminds me of the Buicks of my youth without looking cheesy. The flat-bottomed sport wheel is a nice touch. There's plenty of rear legroom, though the seats are a little too firm, and the angle of the roof doesn't intrude on headroom for backseat passengers. 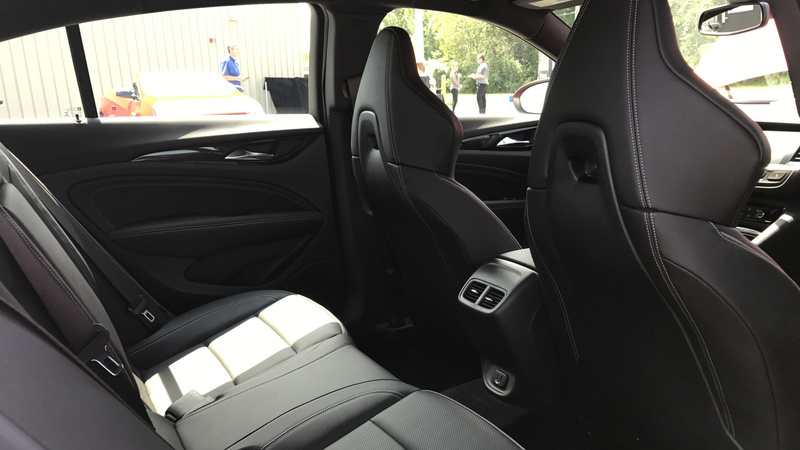 The seats also fold down, creating 60 cubic feet of cargo space—combine that with giant maw created when you open the liftback, and the Buick Regal GS is surprisingly good at swallowing up loads that would stymie a standard sedan. Yet the black-on-black color scheme (the only option) kind of deadens everything on the inside, leaving the Buick Regal GS feeling a little less exciting than it should from the driver's seat. 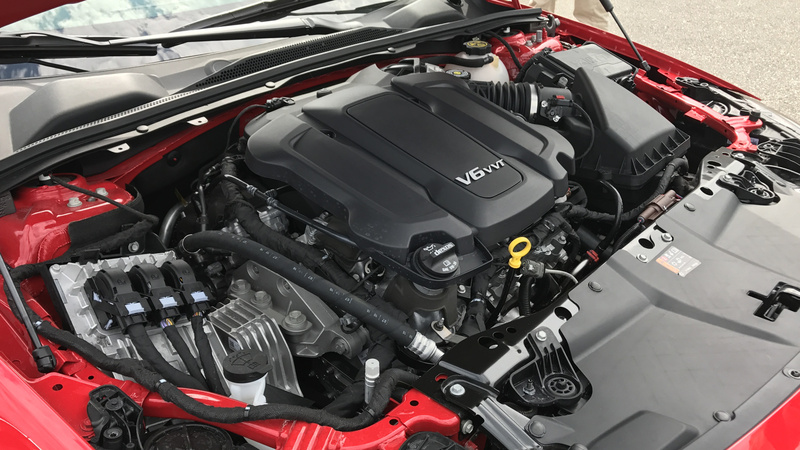 Underpinning all that lie some of the biggest changes for the 2018 model year, including the addition of a 3.6-liter, naturally-aspirated V-6 engine putting out 310 horsepower (up 51 from the previous model) and 282 lb-ft of torque. It's the same LGX engine available in the Chevrolet Camaro, GMC Acadia, and the Cadillac ATS, CTS, and CT6. It's a mark of how much we've acclimated to ridiculous power figures that 310 horsepower reads a little low, and it's worth keeping in mind how few manufacturers are managing to eke out anything north of 300 horses in a V-6 without the help of a turbo these days. It's also a welcome throwback to the days of Buick's nigh-indestructible, ubiquitous Series I 3800 V-6, an engine untroubled by the complete abdication of normal maintenance routines. Power goes to all four wheels through a well-composed nine-speed automatic transmission and an active twin-clutch AWD system from GKN, the same people responsible for the mechanicals in the tail-happy Ford Focus RS. The system can also split torque between the rear wheels to keep everything composed when you hit a sharp corner a little too hot, and performance in the twisties is further aided by the five-link rear suspension found on the current Buick LaCrosse and upcoming TourX wagon. And speaking of, the second-gen continuous damping control wizardry is said to adjust the suspension up to 500 times per second to keep the Regal GS glued to the road. So what does all that add up to? To put it bluntly, a surprising level of competence and capability, with a few caveats. 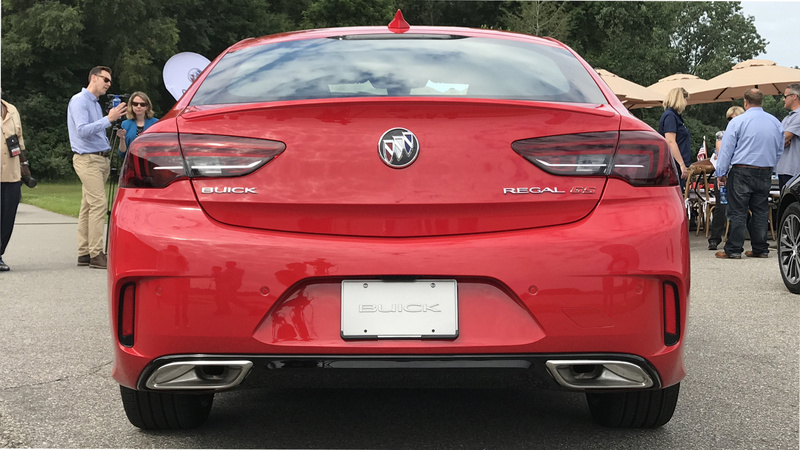 The Buick Regal GS handles sharply and without drama (or torque steer)—especially in Gran Sport mode, which tightens up the suspension and steering and evens out the front-to-back torque bias. It's not on rails in the corners, but it's more decisive and practically begs for a higher entry speed than any Buick in decades. The ride is pleasantly weighty, holding fast to bumps and yumps that upset the less-planted rear end of regular front-wheel-drive Regal Sportback and smoothing out the intentionally hellish pavement of GM's torture test course. The linear torque curve of a naturally-aspirated engine is hard to beat, and the transmission doesn't hunt for gears. On the other hand, the essential Buick DNA is hard to shake. Gone is the little-used manual transmission option, but GM's engineers opted to ditch paddle shifters too—an interesting move in a sport sedan. The steering is heavy but without much actual feedback from the road, and the acceleration is best described as "confident." GM's engineers requested that we stay below 60 mph on the test course, but a 0-60 sprint felt decently quick, somewhere between five and six seconds. It's not going to knock your socks off, though. Last weekend I drove a new Lincoln MKZ with the 400-horsepower twin-turbo V-6 (and paddle shifters), and it's a little too easy to dream about what the Regal GS would be like with an extra 90 horses and some manual control. 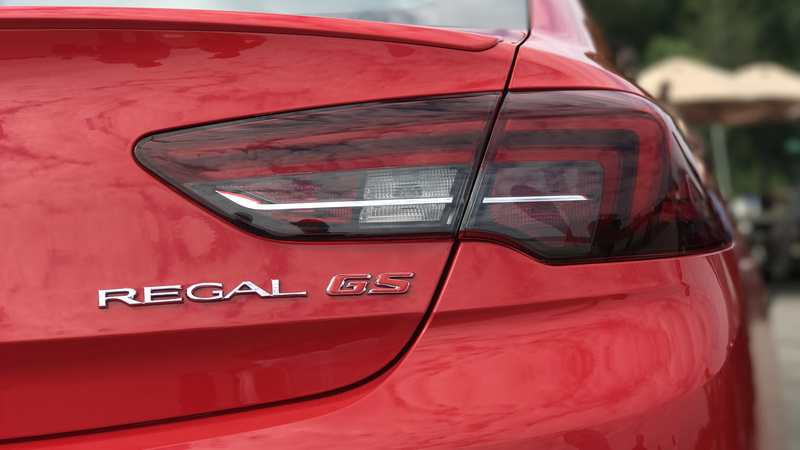 But still, the Regal GS' powerplant is more than enough for a tricky highway merge or an angry left-lane pass. Of course, Buick is likely hoping those shortcomings are offset by something of a bargain price. The Buick Regal GS starts at $39,990, undercutting its German liftback rivals by over $10,000. There are some key differences, but it's rare to find an AWD luxury liftback with over 300 horsepower at a comparatively low price point. Buick is hoping that potent potion of utility and sportiness will keep people under the spell of its sedans for a whole new generation, and having tasted it myself, I have to say it's not an inconceivable thought. But is it too late? We'll find out when the Regal GS hits dealer lots later this fall. It's cheaper and more powerful than the competition from Acura and Lexus. In classic Buick fashion, the Regal TourX will offer a satisfying blend of features and value. A new trim redefines "top of the line" for Buick's leading model. Never mind Buick's new success with compact crossovers, its flagship sedan offers something few other carmakers can: lower blood pressure.